Here is a link to our podcast on the Meb Faber Podcast. In Episode 61, we welcome Jack Vogel, CFO/CIO of Alpha Architect, and the partner of Wes Gray, who you may remember as one of our earliest Meb Faber Show guests. 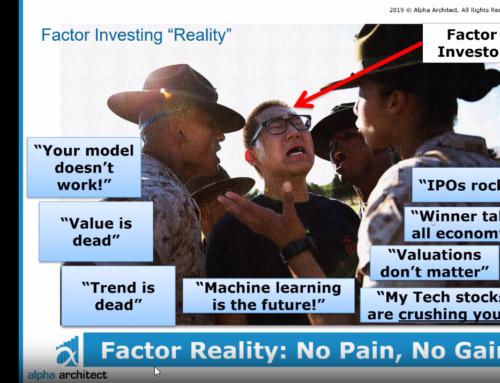 After Jack tells us a bit about his background and how he came to be at Alpha Architect, Meb jumps in, starting with “factors” – specifically, the value factor. Meb asks about Jack’s value philosophy in general, and how he creates a value portfolio. What follows is a great look at how a professional portfolio manager/asset allocator creates a portfolio. Using quantitative tools, Jack starts by constructing the universe of potential assets to include, keeping in mind scale. Next, Jack applies some forensic accounting in order to exclude certain toxic assets that one wouldn’t want in a portfolio. Then, he screens for value. Jack likes using enterprise multiples. Finally, he looks for “quality.” These are things like free cash flow, margin growth and marketing stability.